Our Auxiliary continues to support the Abbotsford Hospital as well as the Cottage-Worthington Pavilion nursing home. Our auxiliary has just made a $10,000 donation to Worthington for their recreation programs. This includes a 24 week Ballet program involving the partnership of an instructor, seniors and young ballet students. 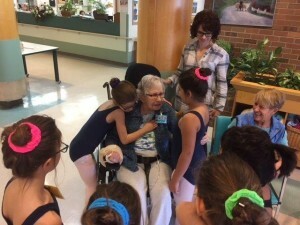 This photo demonstrates the vitality that the young students bring to the seniors at this facility.